I got this prompt from Facebook today when trying to DM a contest winner for PreSonus on Facebook. The winner and I are not friends on Facebook, which means a message would generally go to their “Other” box, where messages are often overlooked. 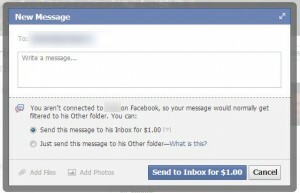 It costs a buck to prioritize your message so that it goes to the regular in-box. Interesting. This entry was posted in Uncategorized and tagged Facebook on January 9, 2013 by Bellsauce.